according to the owners, the Landmark Trust. Freston Tower is a six-storey building dating from the mid 16th century. It is arguably the oldest folly in the country. Looking out over the River Orwell, it can be found in the village of Freston, south of Ipswich. 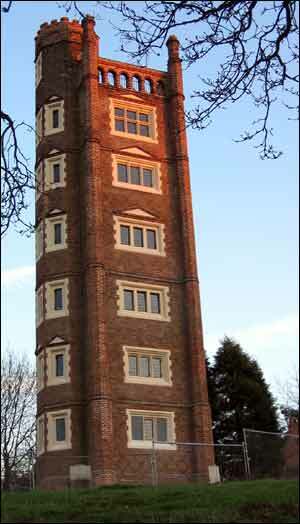 In 1999 the Tower, formerly in private hands, was handed over to the Landmark Trust. After raising a fair bit of money and lots of renovation (cue bags of mature lime putty), Freston Tower became available to let as a holiday home in late May 2004. As you can see, the Tower lends itself to pictures of all varieties, whether photos (both new and old) or illustrations. There are some from the Open Doors weekend in May 2000 showing the inside and the view from the top. Back in 1850 a novel entitled "Freston Tower" was published by a man named Reverend Richard Cobbold. His largely fictional plot centres on the daughter of Lord de Freston, the beautiful Ellen, who studied a different subject on each floor. This, and the Cobbold book, are discussed in one of the historical papers printed many years ago in the Proceedings of the Suffolk Institute of Archaeology. Consult a local guidebook and you're likely to find mention of the Tower, plus some conjecture about its origins. Oh, and if you want to see it yourself, you'll need some directions. I don't believe the connections between me & the Tower are any more than coincidence, but you never know. Sometimes the Tower crops up in the local paper or on the telly, so there's the odd bit of news. Lastly, take a look at what others on the web have said about the Tower in the links page.